If you know me or have read my blog, you know I am a total Paula's Choice junkie. ALL my skincare is Paula's Choice. With the exception of a few (and I mean a few) other items, Paula's Choice products literally litters my bathroom counter, medicine cabinet and closet. Ok so maybe I have a problem!? But who cares when my skin looks the way it does! Which is totally awesome!! Ok back to humbleness!! I am also a Sephora Junkie!! Hello can we say Vib Rouge member every year!! I love getting samples from Sephora when you check out. 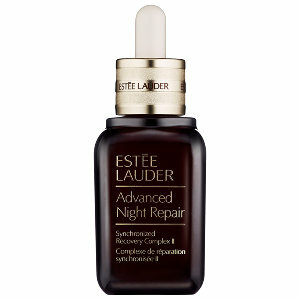 One sample that I tend to get quiet often is the Estée Lauder Advanced Night Repair Synchronized Recovery Complex II. I decided to give this sample a shot after reading about it on Paula's Choice Beautypedia page review. My mother in law also had a bottle of this product on her nightstand and hence why I started googling it in the first place. She wanted to know if her $108 buy was actually worth the price. To my surprise it was. It really was according to Paula's Choice. I also noticed that for a short while, the Youtube community of makeup vloggers/bloggers and so on were raving about this product and with good reason. Normally if you see a product mentioned on Youtube by more than a handful of the well known beauty vloggers, the product takes off. However, after awhile I saw little mention of it. I figured it was because beauty vloggers talk more about makeup and know very little about skincare unless they majored in it during school or studied it properly. So, after much review reading and searching on my part, I decided to give it a shot. I felt guilty cheating on Paula, but hey if she recommended it, I figure why not! Now, something to keep in mind about my skincare routine and facial condition before we go on in this review. Every night I wash my face and use either my AHA or BHA (I interchange these two) vitamin C and retinol. I don't suffer from oily skin except on my nose and I only get dryness if I apply retinol to often throughout the week or we end up in a winter polar vortex like last year (can we say -40F...eh). I don't suffer from pimples or acne, I don't tan and I wear sunscreen every time I go out during the day. However with that being said, my skin hasn't always looked its best until a few years back when I started paying attention to my skin and got rid of harmful facial products and started investing in products that actually made a difference. Prior to that, I had dull looking skin that made me looked aged. I also have a skin condition on my nose that was causing oily fat deposits to form underneath the skin that were leaving bumps and deforming the shape of my nose. Its been over two years since I changed up my skincare routine and I can happily say my nose condition is under control and my dullness is gone! Now back to the review! You can get the Estee Lauder Advanced Night Repair Synchronized Recovery Complex II serum in either a 1 oz or 1.7 oz. It comes in a dark glass bottle with a droplet. The serum is a yellowish milky texture that is light and not greasy or heavy at all. You apply this serum ONLY at nights and a few drops is all you need after cleansing and toning your face. Make sure to apply this after you moisture and not before. You can apply this safely on your neck and around your eyes. Just don't apply on your eye lids or underneath eyes, but around the orbital bone is great. I started using this sample product in the summer last year and I can honestly say, my skin looked amazing the next day. I don't have a night time serum per se because I use my Paula's Choice Resist Ultra-Light Super Antioxidant Concentrate Serum during the day. So while I know I can use the PC serum at night, however I prefer something different that is just as effective to change it up a bit. This serum totally shocked me in its effectiveness. My pores looked much smaller then usual. Keep in mind my pores are small due to the AHA and BHA I use. But this totally made them look like they disappeared. For a second I thought I was 21 years old again!! My skinny looked vibrant and shiny! Not oily shiny but like sunny shiny and alive more then it usually does. Any dryness I had during last years winter, this serum caused the flakiness to disappear. It also made the very very small fine lines around my eyes disappear! What makes this product so amazing is the fact that its loaded with powerful ingredients that actually make a difference on the skin surface. This serum is loaded with tripeptide-32 which has theoretical cell-communicating ability which can help with damage skin cells. Lactobacillus ferment is friendly bacteria which can help with facial issues. This fragrance-free and alcohol free serum definitely scores brownie points there for me because it lacks these irritating ingredients. As mentioned, this did wonders for my skin last year during the harsh winter that literally lasted from September 2014 till April 2015. I kid you not. The snow and cold lasted for that long. My hair, skin and face totally took a horrible toll. If it wasn't for this product at night and PC's serum during the day, my face probably would of been in horrible shape. That winter was so bad that the skin on my lips burned off for months. I was down to only wearing chapstick because lipstick looks awful over dry, chapped, peeling bleeding lips. So while this Advanced Night Repair Synchronized Recovery Complex II serum couldn't save my lips (as its not intended for that) however, it really saved my face! Something to keep in mind when using this serum. This is a SERUM not a moisturizer. You need to pair this with a face cream after you apply this. This will not moisturize your skin. Serums and moisturizers function in two different ways. So lack of a moisturizer can cause your skin a different result then intended by the product. Depending on your skin type will depend on what type of face cream you will need as well as the current season/area you live in. Nonetheless, whatever face cream you use, make sure to use one. And as well, ALWAYS wear SPF 30 (and up) board spectrum protection during the day when going out regardless of the weather condition for the day! Lastly, this serum is totally expensive. I am not even going to kid around on this one. However since the bottle is large, and for the amount you get I can justify the cost. Moreover, due to the amazing ingredients in this bottle, for me it is really worth the cost. Would I love that it was cheaper in cost? Sure. But hey as they say "beauty has a prize". I strongly recommend adding this serum to your night time routine which is loaded with awesome ingredients if the price tag is within your range!